Kastoria, the capital of the prefecture of the same name, is one of Macedonia's most picturesque cities. Built on the shores of a lovely lake, it delights the visitor with its old neighbourhoods, its narrow lanes, stately mansions and Byzantine churches. The city flourished, both culturally and economically, during the Turkish occupation, particularly from the l7th century onwards. Since that time, the people of Kastoria have dedicated themselves to working with furs and to embroidery. Even today, the city boasts a large number of very profitable fur and textile workshops and factories. 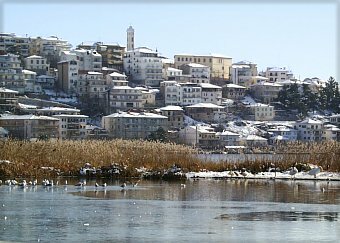 Kastoria has more than 70 Byzantine and post-Byzantine churches, dating from as far back as the 9th century up to the l9th. Most of their walls are filled with frescoes of exceptional quality. The city's famous mansions of the l8th and l9th centuries are also a sight to see. They are usually threestorey edifices with large windows, enclosed balconies and projecting "sahnisia". Their interiors are spacious and sumptuously decorated with woodcarving and wall paintings. Don't miss a visit to the Folk Art Museum, housed in one of the mansions. Lake Kastoria is especially beaufiful in autumn and spring, the best seasons to get to know the town. 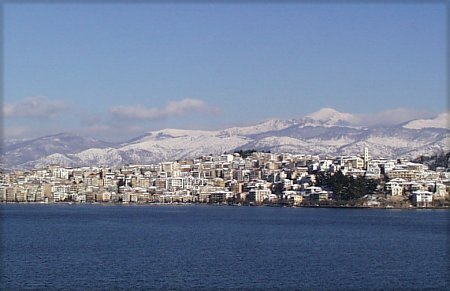 At various points round the lake you'll find restaurants, tavernas, rotisseries, and cafes. Aôgos Orestiko (10 km. 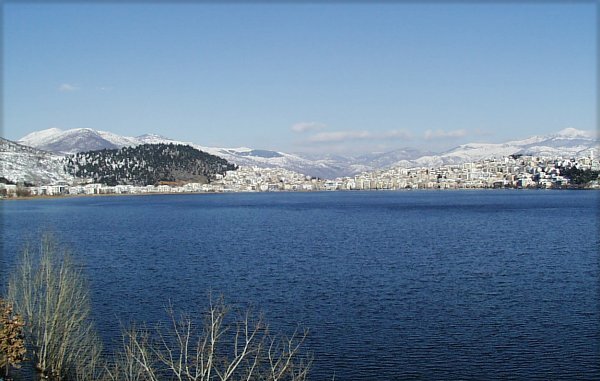 from Kastoria) is a boom town, thanks to the opening of weaving and fur-processing factories theôe. There are many pretty villages in the district, perched on hillsides, surrounded by férs and beech trees, as welt as lakeside settlements with tavernas specializing in fish from the lake. Rowing-Sailing: in the lake. Information, Kastoria Yacht Club, tel. : (0467) 28.956, 29.400. Mountain climbing: Én Mts. Gramos and Vitsi. Information, Kastoria EOS (Alpine Society), tel. : (0467) 24.884. Shopping: Furs, fabrics, flokatis, Wlims. Events: Fuô exhibition in April. By bus: Athens-Kastoria, KTEL bus terminal, Athens, tel. : 512.9308. Thessaloniki-Kastoria, KTEL bus terminal, Thessaloniki, tel. : (031) 522.162. KTEL Kastoria, tel. : (0467) 22.455. By plane: Athens-Kastoria, Olympic Airways, Athens, tel. : 966.6666. Ïlympic Airways .Á. 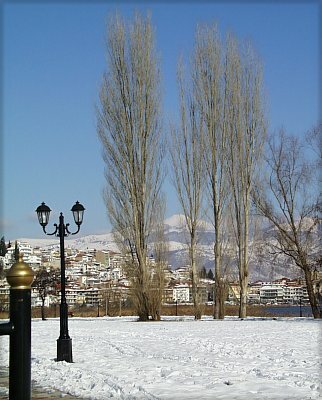 Kastoria, tel. : (0467) 22.275. Kastoria airport, tel. : (0467) 42.99'7.